The 18th in our new series of Mythic Minis, Hierophant Path Abilities II brings you 5 brand-new mythic path abilities for the Hierophant path, from Treesinger and Treeshaper to Saintly Shroud! This Mythic Mini clocks in at 3 pages, 1 page front cover, 1 page SRD, 1 page content, so let's take a look, shall we? 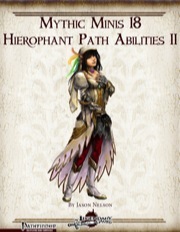 This time, we're all about more hierophant path abilities, after the great first installment for the path so let's check this out! So what do these do? First, there are 2 1st tier abilities, the first of which allows you to use mythic power to change your energy resistance temporarily, but on the fly. That one works. The "Treesinger" ability nets you plant-themed bonus spells known, heal and bolster (and even enthrall) plants, undo effects on organic material made from plants/plants. Mythic power can be used to make the abilities etc. easier to use. Complex and very in line with the concept of the plant-whisperer. We also get 2 new 3rd tier abilities, with the first adding a bunch of spells to your spell-list (and, much like any of the spell-granting mythic abilities here, providing further bonuses) and the second being the improved version of the former plan-based ability, with options to enlarge/reduce creatures and literally, create vast swaths of plants instantly and create feather token-like trees on the fly. And yes, this ability has VAST potential for creative players...If I had a dime for every smart use of growing plants and feather tokens my players sprung on me...Oh yeah, have I mentioned the increase in power due to tier-increase or the repair of objects? Damn useful. There is also a new 6th tier ability, the Saintly Shroud, cloaks you in saintly or profane power, making even contact to you painful for foes opposing your beliefs. Add DR for mythic power and we get a cool ability here as well. Editing and formatting are top-notch, I didn't notice any significant glitches. Layout adheres to Legendary Games 2-column full-color standard and the pdf has no bookmarks, but needs none at this length. 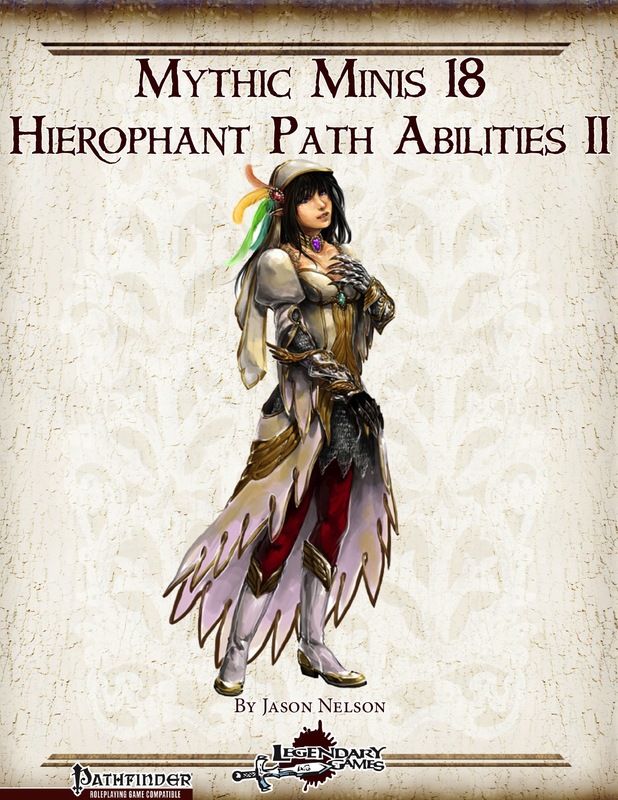 Jason Nelson's second take on Hierophant Path abilities offers even more interesting abilities to choose from, with all interested in druidic/ranger-style abilities getting more than their share due, while those of a more traditional, clerical bent falling a bit short. Like some other Mythic Minis, this one has a bit of spare space that could have been filled with more content, though the blank space is less pronounced than in other installments. Whether this one does it for you depends very much on whether you enjoy the druidic-themed, complex and versatile, very mythic-feeling abilities - the other, with the exception of the shroud, fall a bit flat and feel a tad too mundane, common for my tastes. That being said, I will rate what's here and the great pieces outweigh the somewhat bland ones, resulting in a pdf that can be considered good, though not superb - resulting in a final verdict of 4.5 stars, rounded down by a slight margin to 4. Reviewed first on Endzeitgeist.com, then submitted to Nerdtrek and GMS magazine and posted here, on OBS and d20pfsrd.com's shop!